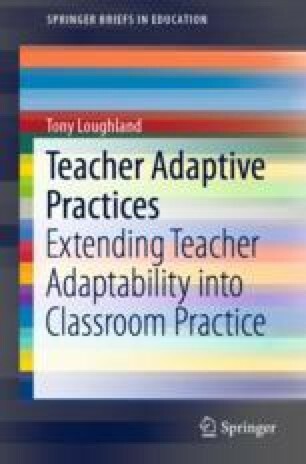 This book has examined the relationship between some of the personal, environmental and behavioural determinants of adaptive teaching. It found that there is a strong relationship between the personal and environmental determinants tested in this study. The relationship between these determinants and the behavioural determinant of teacher adaptive practices was moderate. The future directions for research into a model of adaptive teaching will investigate the relationship between existing and new personal and behavioural determinants. Future refinements in the methodologies adopted for these studies are examined in the last part of this chapter. Bill & Melinda Gates Foundation. (2012). Student perception surveys and their implementation. Retrieved from www.metproject.org. National Education Association. (2010). Preparing twenty-first century students for a global society: An educator’s guide to the “four Cs.”. Retrieved from http://www.nea.org/assets/docs/A-Guide-to-Four-Cs.pdf.